This is a Kahlúa-infused mocha cake with a mocha buttercream made for a school project. Although I'm not particularly fond of coffee on its own, I do enjoy it in cake. The buttercream was not too sweet, and the cake itself was light, fluffy and very aromatic. While it is quite obvious that my cake-writing skills leave much to be desired—Mother could do a better job, but she unfortunately couldn't quite help me with that. (It would have been considered cheating! )—the flowers managed to turn out rather lovely. We crumb-coated the cake so we could use fondant to decorate it. 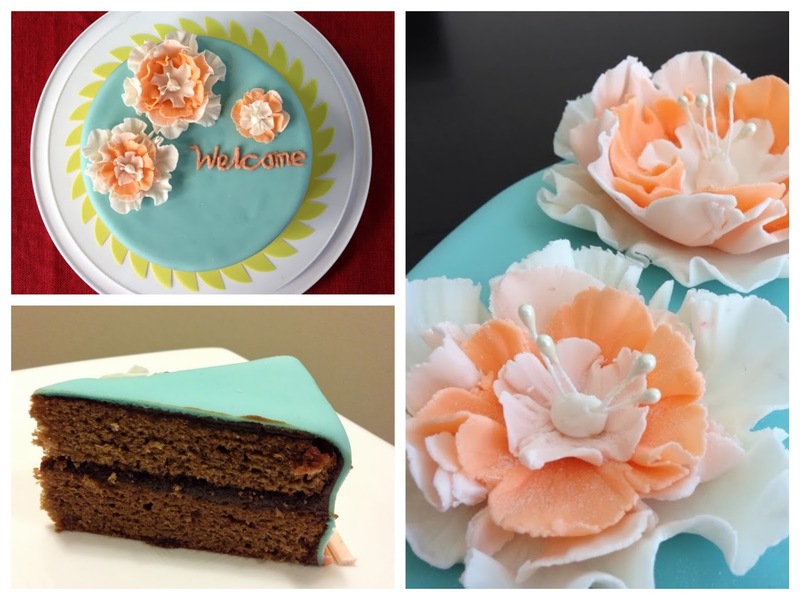 To make the flowers, cut differently-coloured fondant with multiple sizes of flower-shaped cookie cutters. Roll a toothpick on the ends of the petals to curl them. Then, place the bigger flowers in a muffin tray to help set them in a 3D shape. Layer the flowers and stick them together using a little bit of water. We bought the makeshift stamens from Michael's, which we stuck into tiny balls of fondant. Oh ... and the welcome was for our grandmothers who were arriving in town just in time for the cake cutting. Needless to say, they loved it! 1. Grease and line the bottom and sides of two round 9" x 2" cake pans* with parchment paper. 2. Whisk the sugar and egg yolks over a low speed. Gradually increase the speed to medium until the mixture becomes light yellow and creamy. 3. In a small bowl, dissolve the cocoa and coffee in water, Kahlúa, and vanilla. Stir to get rid of lumps. 4. Add the contents of the bowl into the mixture of egg and sugar, pour in the canola oil, and beat until the mixture is incorporated. 5. With a wooden spoon, stir in sifted baking powder and cake flour until well combined. 6. In a medium bowl, whisk the egg whites and cream of tartar into stiff peaks. 7. Fold in a few dollops into the mocha batter, then fold in the rest in thirds. 8. Distribute the batter evenly between two cake pans, each to go on their own baking sheet. 9. Bake them in the upper middle and lower middle racks in a preheated oven of 375º F, making sure to rotate the pans and switch them halfway through. They should be done in 20-25 minutes in total, or until the tops turn out golden-brown and a toothpick comes out clean. 10. Leave the cake layers to cool for 10 minutes. Then turn them over to cool on a wire rack before frosting. *Alternatively, this can be made as a jelly roll. 1. Beat the softened butter and powdered sugar in a mixer until creamy. 2. Add the cocoa powder, coffee, and vanilla extract, and beat for approximately 1-2 minutes until fluffy.